A nice compact bus camper for two people. Drives like a passenger car. 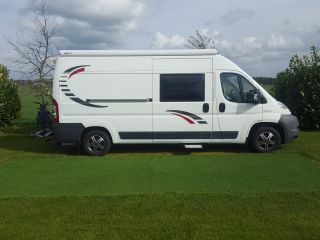 Our Citroen Jumper from 2009 is a wonderfully compact motorhome with a length of only 5 meters. Nice and manoeuvrable and because of this length you can use a normal parking space. We bought this bus last year and last year we personally converted it to a fully equipped camper. The great thing about this bus camper is its driving behavior, which is comparable to a (good) passenger car. He pulls up smoothly if desired, has no / little trouble with slopes and gives a great (out) view due to the high seating. The seats are of course rotatable and selected for seating comfort. In combination with the good (sound) insulation, the cruise control and the air conditioning you will arrive at your final destination, even after hours of driving! As an extra, the camper has a rear-view camera. Easy for parking, for example. The interior of the bus is also complete and perfectly equipped for 2 people. Wardrobe space for clothing etc. is located above the bed, above and below the refrigerator and above the cabin. Other things can be stored under the side seat and of course in the "garage". In short, sufficient storage space. Because we like reading a lot, there are fixed and rotating spots mounted in the seating area as well as in the sleeping area so that you have (reading) lighting in any desired position. For the atmosphere, the bus is also equipped with dimmable LED lighting, both inside and outside, and can be operated separately with one button. The bed is 195 cm long and 135 cm wide. Not super big, but more than enough for 2 people. However, for people taller than 1.90 m, it is not recommended. Getting in and out of bed goes through the hatch that in combination with the porta potti can serve as a step. Furthermore, the camper is equipped with a 150 Watt solar panel, a household battery, an 80-liter clean drinking water tank and a diesel-operated parking heater so that you can stay in the "bush" for longer periods of time and are independent of electricity and other luxury facilities. The parking heater has a capacity of 2 kW, more than enough for a pleasant winter sports holiday. In addition to heat, the parking heater also has a ventilation position precisely to make the hot days more pleasant. The kitchen is equipped with a 3-burner gas stove, a sink with running water, four lockable drawers and a cupboard for various attributes. Cutlery, plates, pans and other accessories are part of the standard inventory. As mentioned, this camper can also handle the city because of its length. However, it is too high for a parking garage. That is why, if we want to spend a little longer in the city, we always take the bike. With the camper we drive to the outskirts of the city, take the bikes from the wearer and, if possible, are even more flexible than walking. Plus you can take more with you! In addition to the kitchen attributes, 2 camping chairs and a height-adjustable table also belong to the inventory. In consultation it is always possible to also take other camping gear with you. Consider, for example, loungers, panniers or, for example, petanque. Well, almost too much to mention and then I don't even have the skylights with an inward or outward directed fan, the insulating darkening, the extra storage space under the folding space etc. 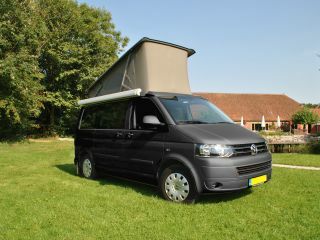 In short, a fully equipped camper for a wonderful holiday. Full tank, so also full tank back. Use the camper as if it were your own camper.